NEW YORK (Dec 4): Crude prices settled up about 3 percent on Thursday, the eve of an OPEC meeting, as traders who expect no cuts in the group's output hedged their positions in case of a surprise outcome at a meeting of the world's largest oil producers. A tumbling dollar and a surge in heating oil prices also supported the rally in crude, which neared 6-1/2 year lows just a day ago. "Bear markets are known to have dramatic rallies," said Jeffrey Grossman, crude futures dealer at BRG Brokerage in New York. "I keep telling people how vulnerable a market this low is to upward action." Brent crude settled up $1.35, or 3.2 percent, at $43.84 a barrel, rising more than $2 at the session high. On Wednesday, it had closed down almost $2, coming just about 20 cents from making a new low since March 2009. U.S. West Texas Intermediate (WTI) crude settled up $1.14, or 2.9 percent, at $41.08. WTI's front-month January futures hit a contract low of $39.84 on Wednesday. 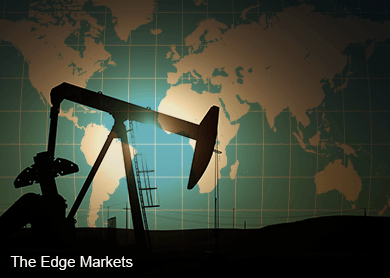 Crude prices have been volatile, reacting to remarks from oil ministers of the Organization of the Petroleum Exporting Countries who are gathered in Vienna for a meeting on Friday. Brent rose more than $1 in early New York trade, then pared gains before rallying again in the afternoon. Early gains came after a report sourced to a senior OPEC delegate said Saudi Arabia would next year propose a deal to balance oil markets with non-OPEC help. A Saudi oil source later dismissed that report, and Brent pared gains. The Saudis have so far resisted production cuts to support prices. Iran and Russia have also ruled out production limits. But as Thursday's settlement approached, oil prices regained steam, rising more than 5 percent at one point. The surge surprised analysts, who said some traders were probably hedging against a possible surprise at the OPEC meeting. "The idea that there could be a surprise cut is making people a little nervous," said Dominick Chirichella of the Energy Management Institute in New York. The dollar fell 2.3 percent for its steepest one-day decline in more than 6 years as the euro surged on the European Central Bank's smaller-than-expected cut in interest rates on deposits. Heating oil settled up 4 percent after being depressed in recent days by a lack of cold weather in the northeastern United States, a major market for heating.